This entry was posted on November 30, 2017 by Logs Direct. Lancashire-based wood and solid-fuel supplier, Logs Direct, is celebrating the success of its brand-new pizza oven log, Piccante, following its launch in November 2017. The compressed, virgin-beech pizza log was launched at the European Pizza and Pasta Show, staged at Olympia in London, where it instantly caught the eye of restaurateurs with wood-fired pizza ovens. The product benefits – being completely food-safe and HACCP and carbon tax-compliant – have attracted chefs wanting to do everything possible to comply with food and environmental regulations. 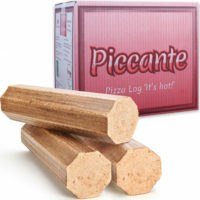 ‘Piccante’ logs are free from additives, glues and adhesives. These Italian-made eco-logs create neither carcinogenic fumes nor toxic ash, delivering another benefit of improved cleanliness beneath the oven. Those wanting more value out of their logs and a longer burn have also been quick to place repeat orders, following their first trial of Piccante logs. The eight-sided logs have a high calorific value and rest in a way that reduces contact with the oven floor, improving air flow around it and so improving combustion. This leads to much better burn times and an oven operating with consistent heat output, thanks to a stable and predictable burn. The easy-to-light beech log also burns with a lower flame, ensuring pizza bottoms are not tainted or singed by the fire. It allows the oven to get up to operating temperature quickly, as its dense nature means it has very little water content. Exhibiting at the PAPA show, and at the more recent Northern Restaurant and Bar exhibition in Manchester, have led to customer acquisition in the form of restaurants based as far afield as London, Windsor and Leicester. Gourmet pizzerias have been particularly keen to take Piccante on board, believing it to be compatible with their high culinary standards. Logs Direct sales director, Stephen Talbot, says: “We have had excellent take-up of our Piccante product following our attendance at various catering exhibitions and are delighted with the industry’s response to it. We believed that a log with its clear benefits would tick the box of the UK restaurateur, so sourced a supplier who could deliver exactly what we required.